There was a big hole in the Portland lineup, as the player who manned the third spot in the lineup for the last three months was on his way to Safeco Field. On top of that, Yoan Moncada was scratched before the game. Fortunately, Teddy Stankiewicz made it easy on the Benintendi- and Moncada-less lineup with a nearly perfect outing. The 22-year-old right-hander tossed a one-hit shutout, striking out seven without issuing a walk. He retired the first 16 batters he faced before surrendering a one-out single in the sixth. Unfazed by losing the no-hit bid, Stankiewicz promptly shut down the next 11 hitters. Mauricio Dubon led the Portland offense, delivering a pair of RBI doubles in his 2-for-4 night. Dubon now has eight extra-base hits in his last 10 games, good for a .605 slugging percentage. Ryan Court added an RBI double of his own, and Rainel Rosario scored on both of Dubon's doubles. Stankiewicz wasn't the only pitcher to turn in a career performance on Tuesday night. 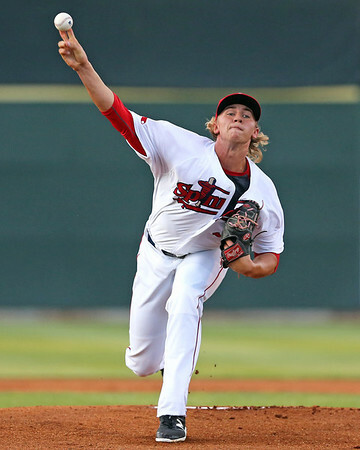 The stock of Michael Kopech (pictured, right) continues to rise, as the flame-throwing righty struck out 10 over six innings of one-hit, shutout baseball. After struggling badly with his control in his last couple outings, Kopech pounded the strike zone, walking only one and throwing 53 of 78 pitches for strikes. The six innings matched a career high set last season with Greenville, and the 10 punch outs were a career best. Per Alex Speier of The Boston Globe, Kopech's fastball sat in the 97 to 99 m.p.h. range. It was a balanced offensive attack for the Sox. Their only extra base hit was a double off the bat of Jordan Procyshen, but they added nine singles, walked six times, and stole four bases as a team. Brian Hudson was 2 for 3 with a walk, a run scored, and a steal. Rafael Devers started August just like he left off in July, recording a two-hit game with a pair of RBI. Roniel Raudes joined the parade of dominant starters, but the Greenville offense was less obedient than the right-hander's curveball in the tough-luck loss. Raudes allowed a run on just three hits, and matched a career high with eight strikeouts against only one walk in six innings. He now has 90 strikeouts against only 18 walks in 91 2/3 innings on the year. Austin Glorius struck out a pair and gave up two hits in two scoreless innings of relief, and Trevor Kelley had two strikeouts in a perfect ninth. Kelley has not been scored on in 11 of his 14 outings. There was little to speak of in the way of offense for the Drive, as a trio of Tourists tossed a three-hitter. Luis Alexander Basabe had an eighth-inning double, his 19th of the season. Making his first start of the year after a dozen relief appearances, Pat Goetze allowed two runs on six hits in four innings. He struck out one without walking a batter. After a horrendous start to the year, Goetze has been solid of late, allowing only four runs in 16 2/3 innings across nine appearances. Brad Stone pitched a scoreless fifth but his control abandoned him in the sixth. After inducing a pop out, he hit a batter, made a throwing error on a pickoff attempt, uncorked a wild pitch, then walked two batters before giving way to Matthew Gorst. Gorst was able to strand two, and tossed 2 2/3 shutout innings. C.J. Chatham got his first hit since moving up to Lowell with a third inning single. He then drove in his first run with a sacrifice fly in the fifth. Yoan Aybar had a pair of hits, and Tucker Tubbs delivered an RBI double. 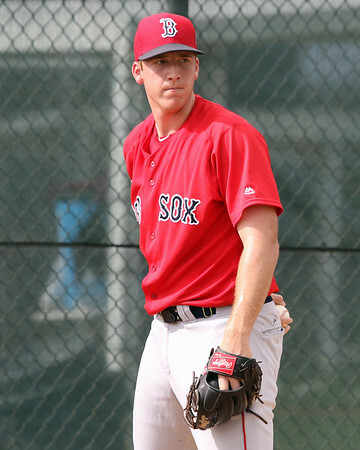 Robby Sexton, Boston's 14th-round pick in the June draft, made his professional debut on Tuesday. The left-hander got the start, tossing two hitless innings while walking one and striking out three. Junior Espinoza followed in a piggy-back role, throwing five innings of relief to earn the win. Espinoza surrendered an unearned run on five hits while striking out three and walking one. Devon Fisher threw two scoreless innings to close out the win. Lorenzo Cedrola has been the GCL Sox' most consistent performer all season, and he led the way again on Tuesday. Cedrola was 3 for 3 with a double, a walk, and two runs scored as his season line rose to .346/.427/.439. Rafael Oliveras was 2 for 5 with a double and two RBI. It was an all-Espinal left side of the infield, with both Stanley Espinal and Santiago Espinal (no relation) each going 1 for 3. It was a tough day at the park for the Sox, but Marino Campana continues to dominate since coming down from the Gulf Coast League. The center fielder was 2 for 3 with a home run, double, walk, two runs scored, and two RBI. Through nine games he is hitting .367/.441/.633. Starter Alejandro Rodriguez had his toughest outing of the year, giving up eight runs (seven earned) on nine hits in 3 1/3 innings, nearly doubling his ERA to 2.51. A marathon contest came to an end in the bottom of the 14th, when Everlouis Lozada doubled to center to score Fabian Andrade for the walk-off win. It was the ninth double of the year for Lozada, who had three of the Red Sox eight hits. Jose Gonzalez surrendered an unearned run in the first, then he and the bullpen combined for 13 consecutive innings of shutout baseball. Gonzalez gave up four hits and struck out four without walking a batter in six innings. Shair Lacrus was dominant in four innings of relief, giving up only one hit and striking out five without a walk. Joan Martinez followed with three innings of shutout relief, and Victor Familia got the win with a scoreless 14th. Player of the Day: A number of the starting pitchers on Tuesday deserved consideration here, as the trio of Teddy Stankiewicz, Michael Kopech, and Roniel Raudes combined for 21 innings, five hits, one run, two walks, and 25 strikeouts. Stankiewicz gets the nod for completing his start, and for putting the Sea Dogs on his back on a night when they featured a depleted lineup. After a tough string of outings in June and July, it was the third quality start in his last four for the 2014 second-round pick.